The Workplace Values Your Employees Value More Than Money. Dreams Worth More Than Money: What Employees Care About More Than Compensation. People have always questioned whether money can buy happiness. But does the rise or fall of your paycheck change the workplace factors that are most important to you? From past research, we know that money and happiness are linked. A famous study from Princeton University researchers showed higher income increases happiness, but only up to about $75,000 per year. Beyond that, higher pay doesn’t change happiness much. We also know money matters for workplace satisfaction. 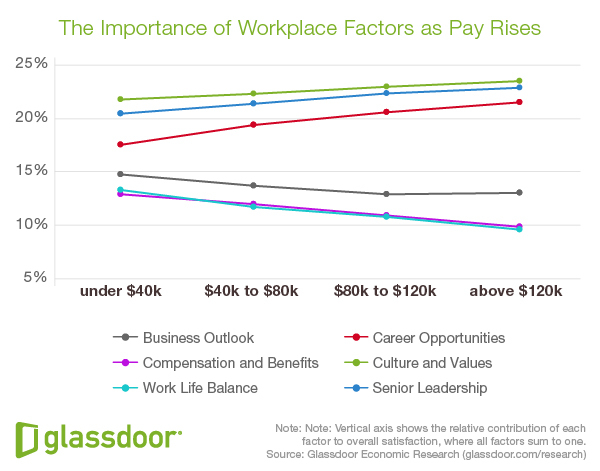 Glassdoor research shows higher pay is statistically linked to higher job satisfaction, but the impact is small. To most workers, pay matters much less than other factors like culture and values, career opportunities, and the quality of senior leadership. In our most recent analysis, we ask a different question: Do the job factors you care about most change as your income changes? As pay rises, do our workplace priorities around compensation, work-life balance and career opportunities shift as well? Levels: Higher Pay, Shifting Priorities. To study this question, we started with a sample of 615,087 U.S. based Glassdoor users reporting salaries of less than $200k a year who contributed at least one salary report to Glassdoor between January 1, 2016 and September 30, 2016. We then sorted the over 600,000 users into four further groups based on income. We then examined which of these six workplace factors were the most “important” predictors of overall employee satisfaction for each income group. This was done using a method known as “Shapley value” analysis. It shows which workplace factors have the most explanatory value in terms of the relative contribution of each to the R-squared of each income group’s regression. In other words, under this approach, the six workplace factors can be thought of as a “pie” in terms of predictive power of employee satisfaction. We then add and drop factors from our model, and examine how the “pie” of predictive power changes with each adjustment — how more or less important a factor is to overall satisfaction. This approach allows us to identify which factors are the most statistically “important” predictors to overall employee satisfaction. Shine: More Money, Different Problems. The figure below shows the most important workplace priorities for all workers in the sample together, regardless of income level. Similar to previous research, we find three factors are the main drivers of employee satisfaction. The culture and values of the organization are the largest predictor of employee satisfaction, accounting for 22.1 percent of the pie. The quality of senior leadership (21.1 percent) and career opportunities (18.8 percent) are also strong predictors of overall employee satisfaction. By contrast, positive business outlook of the organization (13.9 percent), work-life balance (12.1 percent), and the quality of compensation and benefits (12.0 percent) are the least important predictors of employee satisfaction. Next we show how these workplace priorities change with income. The figure below shows how workplace priorities change as pay rises. We see a clear pattern, with some workplace factors becoming more important as pay rises, with others becoming less important to overall employee satisfaction. I’m A Boss: Why Workers Discount Compensation and Benefits. Three factors become less important as pay rises: compensation and benefits, work-life balance, and business outlook for the company over the next six months. Regardless of income, compensation and benefits (shown in purple) is among the least important workplace factors. Not surprisingly, as income rises we find that compensation and benefits become less important to workers. For workers earning less than $40,000 per year, compensation and benefits makes up 12.8 percent of the predictive pie, while it falls to 9.8 percent for workers earning more than $120,000 annually. Work-life balance (in light blue) also becomes less important as income rises. For workers earning less than $40,000 per year, work-life balance contributes 13.2 percent to overall satisfaction, declining to 9.5 percent for workers earning more than $120,000 per year. This suggests that the higher one’s income is, the more they are willing to spend time at work, sacrificing leisure time. To an economist, this is consistent with that’s known as an “upward sloping” supply curve for labor. For workers earning between $40,000 and $120,000+, work-life balance is least important, while for those earning less than $40,000, compensation and benefits remains the lowest predictor of overall satisfaction. Finally, positive business outlook of the company (in grey) also falls in importance as pay rises. However, the decline is very small compared to the other workplace factors we examined and flattens for workers earning more than $120,000 per year. This may be because lower-income workers are more concerned about economic insecurity, or that higher-income workers are mostly employed in larger, more stable companies. 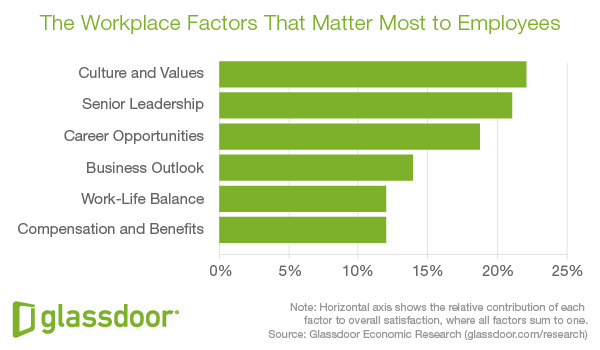 The Difference: 3 Workplace Factors High Value Employees Value The Most. Three factors matter more to workers as pay rises: culture and values, the quality of senior leadership, and career opportunities. As pay rises, it’s no surprise that culture and values rises in importance to workers. The culture and values of a company ranges in importance from 21.6 percent of the pie for workers earning less than $40,000 to 23.4 percent for workers earning more than $120,000 per year. Beyond some pay level, employees begin looking for other workplace amenities they value. Working for an organization with positive values and a healthy and nurturing culture becomes more important to workers as pay rises. Similarly, the quality of senior leadership and career opportunities (in red) rise in importance to workers as pay rises. Quality of senior leadership ranges from 20.4 percent to 22.8 percent among workers earning less than $40,000 and more than $120,000 per year, respectively. Similarly, career opportunities become more important as pay rises: 17.5 percent contributing to the overall satisfaction pie for those earning less than $40,000, ranging to 22.8 percent for those earning more than $120,00 per year. While lower-income workers are more concerned with pay, business stability and work-life balance, as pay rises employees shift priorities toward long-term careers, working under great leaders, and spending their days in a workplace with positive culture and values. Believe It: Why Money is No Substitute for Culture. For employers, this research bolsters the idea that pay and benefits—while important—are only one factor when it comes to keeping employees engaged over the long term. As pay rises, compensation and benefits become less important as drivers of employee satisfaction. Instead, other workplace factors play a more important role. Regardless of income level, we find three factors are the most important drivers of job satisfaction: culture and values, senior leadership, and career opportunities. For job seekers, this suggests that finding satisfaction at work has less to do with pay, and more to do with broader workplace factors. Although pay is important, it is not among the main drivers of workplace happiness. Instead, the big drivers of job satisfaction are working in a company that shares your cultural values, that offers a meaningful career arc, and that has senior leaders you support and believe in. When it comes to finding satisfaction at work, these are the key factors that matter most—regardless of income level. About the Author: Patrick Wong is a data scientist at Glassdoor. He has developed a variety of marketing tools using statistical models and has contributed to Glassdoor’s understanding of user experience through a variety of analytical research projects. Previously, Patrick led the web analytics program at Art.com. During his time there he analyzed optimization of site conversions and provided insights to help marketing and product teams make the best decisions. Patrick holds a master’s degree in finance and applied economics and bachelor’s degrees in economics and music from the University of California, Santa Cruz. Previous PostStrings, Sourcing And Search Tools: Live! Next PostWhy Learning Agility Is The Only Skill Recruiters and Sourcers Really Need.